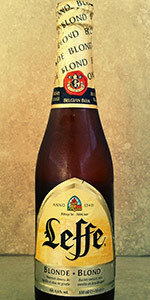 Home Beers Abbaye de Leffe S.A.
Leffe Blonde | Abbaye de Leffe S.A. Pours out a light orange color with an average fluffy head; very bubbly. The aroma is of lightly roasted malts and sugar. The taste is of citrus and heavy on the malt. Definite orange and peach flavor. it has a nice carbonation to match this style. Overall this beer is just too average. I feel it is the run-of-mill Belgian Pale Ale...it just doesn't do it for me. A consistently dismissed beer due to ownership by InBev. Pity because Leffe Blonde is an excellent example of the style. "Better" abbey blondes generally have too much of everything for my tastes. I'm looking for something with the requisite Belgian esters that's also lighter, crisper and with less of a lingering mouth-feel than a beer like a St Feuliien blonde -- and Leffe delivers as well as any in the style. As a non-sweet beer drinker, this beer is sweeter (to me) than most any beer that I consistently drink with flavors reminiscent of candy corn. But the sweetness is pleasant as it is balanced by a slight acidity and wheat-flavored undertones. A winner. InBev or not. I'm shocked at the bros rating. This should not be rated and put on the same level as the American light beer that really taste like water and not beer. Because It's a really good beer. It's smooth and very drinkable. It's not the best for its style which I think is Duvel. But this is the Best beer in this style for the price. You can get a 6 for 8.99$ . If you're looking to explore Belgian ales this beer is a great place to start. Color is what you want! Gold perfection. Tastes and smells like malty banana nutty and little caramel notes. Nothing funky or weird going on. Just greatness and smooth. Would like to try this on tap. I REALLY like this beer. One of the first Belgians I had and opened my eyes to the trapist beers of Belgium. Beautiful amber color; light champagne-like head; clear through & through. My favorite drinking out of a stemmed beer glass. To me, it compares with the best out there - only topped by Chimay in my mind. I bought a sixer of this stuff at a beer store where everything was overpriced, thinking "what's one buck more when I can get a real Belgian?" I remembered trying this for the first time at Monk's Cafe in Philly and being very impressed. Maybe I was just excited to be at Monk's, or maybe this beer's just better on tap, but man, what a let down. This beer's just average. LOOKS great on its way into the glass; very carbonated, and produces a light, puffy head. Smells like a Belgian Pale ale, but no particularly unique aromatic characteristics. Tastes... like a pale ale, albeit a malty Belgian pale ale. What startles me is the sour aftertaste. It's not a good green apple sour, but more like an apple juice gone bad sour. I won't rule out buying this on tap againa, but I sure don't plan on buying it in the bottle again anytime soon. Pours a clear, dark golden coloration with a medium, creamy head. Smells of sweet, caramel malt and spicy and mildly fruity estery/phenolic yeast aromas of clove, banana and green apple. Taste follows the nose, being dominated by sweet, caramel malt and estery yeast, with notes of honey, clove, banana and green apple. Finishes with a very light bitterness, some sweetness and those estery yeast notes lingering, almost turning a bit phenolic in the aftertaste. Smooth mouthfeel with a medium body and carbonation. This is a pretty nice Belgian Blonde, but the balance seems a little off, which keeps this from being truly great in my opinion. A little too sweet and heavy on the clove, especially turning a little harsh and phenolic in the aftertaste. Ok. It’s a world brand from the biggest brewing company in the world. Nevertheless, a solid Belgian abbey brew. Most of the crafted Belgian blondes are not as good. Nice head, wonderful color. The banana taste makes it remarkably special. Great beer for a reasonable price. Make sure you drink it from the right glass. I can not understand, what I consider to be severely unwarranted low ratings for this beer. No, it's not barrel aged, double hopped, triple hopped or what ever. Maybe it is the Belgian equivalent of an adjunct lager . . . Who knows. What I can say is this . . . It's a very, very tasty and easy drinking Belgian beer ! And when did easy drinking become a bad thing ? Enjoy. Pours a clear, effervescent gold with a towering, two-finger white head; excellent retention and a fair bit of soapy lacing clinging around the glass. Aromas of clove, yeast, and earthy spice almost verging toward peppery, which merges nicely with the slight herbaceousness on the finish; detailed and delicate. Taste lets in some balanced banana notes to go along with earthy clove, undertones of spice, and some herbal tones; the balance is done nicely here, even if it does lean one-dimensionally toward the clove/banana notes at times. Mouthfeel has medium-high levels of carbonation that excellently carry its light-medium body and allowing a certain balanced robustness to flourish somewhere in between; the finish is bright and clean, leaving enough impact on the palate without becoming too overbearing. Easy-drinking and nicely refined abbey ale that is consistent throughout and maintains a smooth profile throughout; solid Belgian to return to if the mood for a lighter beer strikes. Probably the most popular beer in Europe, both for locals and tourists, for beer snobs, there are way better than that. Leffe Blonde has various aromas from sweet honey to banana and caramel. It's pretty cheap in Europe and a keg would be fairly available for a good party. In other words, a good, everyday beer. 330ml bottle poured into a tulip glass. Today I had a glass of Leffe with pasta, with red sauce and chicken breast. Surprisingly, it paired amazingly well. The sensation and aftertaste were absolutely great. I'll definitely try to repeat this combination. A - Bright gold pour with steady mild carbonation. S - Coriander, yeasty, some honey malt, mild banana. T - Straight yeast, light banana, some peppery seeds of paradise, and cloves. M - Medium body with very creamy texture. O - A solid go to beer that opens the eyes of macro drinkers. Had this so many times in the past and wondering why it took so long to finally review this beer. What a great blond. An authentic Belgian abbey beer which can be dated back to 1240 a the Abbey de Notre Dame. Leffe is now owned and produced by Stella Artois. Quite delicious, with well rounded fullbodied taste. With a higher than usually abv at 6.6%, it goes down very easily. This beer is quite delicious, it hold a very appealing aroma and appearance. Very thick in texture, which make sit even more appealing to the palate. Leffe Blond has a sunny golden color, mellow malt flavours, and a touch of spiciness to deliver full-bodied delicate sweetness; though it takes some time to drink because of the sweetness. Leffe Blond has a well-balanced malt flavouring worthy of any beer drinker. The aroma brings me back to something in my childhood, but I can't quite put my finger on it. Cheers. Very clean, pale beer with a brief, 1 finger head. Extremely clean, smooth taste that completely hides the higher ABV. Very little hop character, but not too malty. Overall a very clean, smooth, and easygoing beer. This is my definition of a Belgium blonde ale, I love it! Full of carbonation, Full of flavor at start with fruity dry finish. Love it, love it, love it!!! Bright blonde and bubbly. Aroma is sweet with Belgian yeast notes. Flavor is so very sweet that I am reticent to take another sip. (I relented). The finish is dry, but also sweet. Flavorful, but not multifaceted. Appearance  The body is light orange in color with some carbonation visible. The head was decent but went down rather quickly. Smell  The yeast aroma was mixed with a strong orange scent. There were the standard Belgian spices at the nose as well. Taste  This one is not bad. The yeast comes out more in the taste. There are few more fruits that show up such as ripe melons and grapes. The spicing is light and subdued. Mouthfeel  Theres some good carbonation in there. This one went down smooth and easy. Drinkability  This was a nice ale that went down pleasantly. Comments  Theres nothing real exciting to this one, but it got the job done. It lacked the bite that I personally enjoy in a good BSPA, but went about its business successfully. Poured into a pint glass from a bomber. Hazy straw yellow with 3 finger frothy head. Taste of clove and malt with a smooth and balanced feel. I'm going to discuss something a bit more mundane, price point. I want to remain neutral so will not name the retailer. I will just say that they are a "big box" wine/liquor/beer store. Leffe Blonde is actually pretty reasonable and, surprisingly, less expensive than Heineken. Maybe it's the monopolistic nature of much of the the beverage market but I think we beer consumers are currently "being taken for a ride" as far as European beer prices! The US Dollar is at near historic highs vs. the Euro. Three years ago, it cost about $1.43 cents to buy one Euro. Now the currencies are nearly at parity! Why aren't we seeing a dramatic drop in the price of European beer??? Sampling right now on 3/9/14 but it has been over a year ago since I had one. 330ml (11.2 oz.) bottle chilled down to 36 degrees F in my beer cooler and poured into a tulip glass. Pours lighter/medium amber with a 2-finger white foamy head that settles down to a thin layer on top. LOTS of sticky lacing. The aroma is of a fruity yeast and malt. Taste was sweet with even a hint of banana. Goes down easy. Overall, I was pleased with this one. Very clear bright pale gold body under fluffy white head. High carbonation. Bready yeast-driven flavor of light spice (hint of clove-tea and apple skin). Perhaps slightly over-bitter in the aftertaste, almost like homebrew made from old liquid extract. Conclusion: A nice Belgian pale, but not outstanding. Better choices abound, but this is not bad by any means. If I made it at home I would be pretty happy with it. I think the "Bros" rating of "poor" is pretty harsh. I think this is pretty good. Not a fan but my wife really likes it! Have been trying to get out of my HOPPcentric ways. Seems to affect how beers w\o hopps taste and sometimes i'm to negative to them. Now i've decided to just drink more of the styles at a time to compare. Cheers to more tasting! Sweet, thin watery gunk. Typically Leffe yeasts and sugars are more pronounced than the barley or hops. Bleigh! Macro sugar water with a nice carbonation stream. Clear gold body with a fluffy, light head. Smells slightly medicinal and almost fruity but leaves me wanting more in all categories. Leffe Blonde from Abbaye de Leffe S.A.